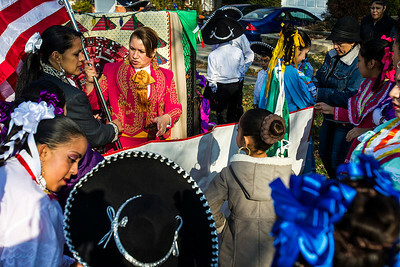 Kyle Grillot - kgrillot@shawmedia.com Ballet Folklorico Girasol members prepare for the start of the Merry Cary Holiday Parade Sunday in Cary. Parade participants including local businesses, community groups and organizations gather along South Wulff Street and advance down West Main Street towards Downtown Cary. 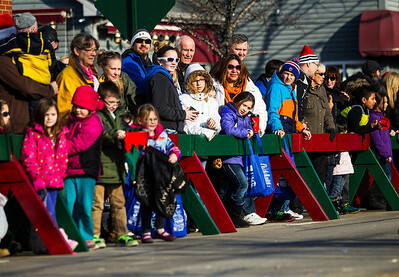 Kyle Grillot - kgrillot@shawmedia.com The crowd watches from the sidewalk during the Merry Cary Holiday Parade Sunday in Cary. Parade participants including local businesses, community groups and organizations gather along South Wulff Street and advance down West Main Street towards Downtown Cary. Kyle Grillot - kgrillot@shawmedia.com Corinne Schneider, 3, of Cary picks up candy off of West Main Street during the Merry Cary Holiday Parade Sunday in Cary. Parade participants including local businesses, community groups and organizations gather along South Wulff Street and advance down West Main Street towards Downtown Cary. 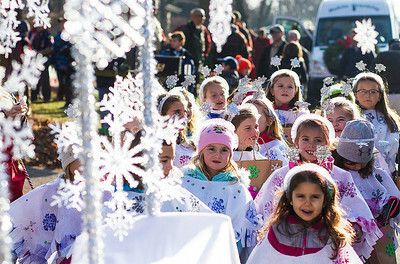 Kyle Grillot - kgrillot@shawmedia.com Members of Girl Scout Troop 968 wait along South Wulff Street before the start of the Merry Cary Holiday Parade Sunday in Cary. Parade participants including local businesses, community groups and organizations gather along South Wulff Street and advance down West Main Street towards Downtown Cary. Kyle Grillot - kgrillot@shawmedia.com Trevor Bachmann, 10, of Cary picks up candy off of West Main Street during the Merry Cary Holiday Parade Sunday in Cary. Parade participants including local businesses, community groups and organizations gather along South Wulff Street and advance down West Main Street towards Downtown Cary. 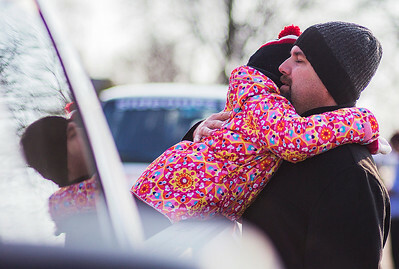 Kyle Grillot - kgrillot@shawmedia.com Brett Anderson of Cary gives his daughter Madison, 5, a hug before the start of the Merry Cary Holiday Parade Sunday in Cary. Parade participants including local businesses, community groups and organizations gather along South Wulff Street and advance down West Main Street towards Downtown Cary. 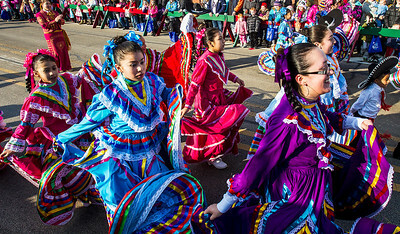 Kyle Grillot - kgrillot@shawmedia.com Ballet Folklorico Girasol members advance down West Main Street during the Merry Cary Holiday Parade Sunday in Cary. Parade participants including local businesses, community groups and organizations gather along South Wulff Street and advance down West Main Street towards Downtown Cary. 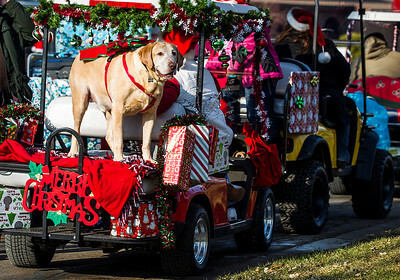 Kyle Grillot - kgrillot@shawmedia.com Clyde the yellow lab waits with the community of Spring Beach before the start of the Merry Cary Holiday Parade Sunday in Cary. Parade participants including local businesses, community groups and organizations gather along South Wulff Street and advance down West Main Street towards Downtown Cary. 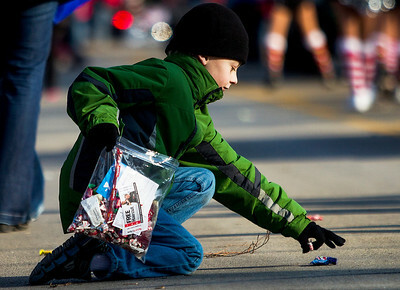 Trevor Bachmann, 10, of Cary picks up candy off of West Main Street during the Merry Cary Holiday Parade Sunday in Cary. Parade participants including local businesses, community groups and organizations gather along South Wulff Street and advance down West Main Street towards Downtown Cary.